His Dream: To become an engineer. In this post, we’d like to put the spotlight on Joseph Guerchon Jean, a student in the 9th grade at the Institution Mixte Martin Luther in Marmalade, north Haiti. In the 2016-2017 school year, Jean ranked best in his class on the Haiti National Exam with a score of 7.84. Jean’s success in the classroom is the result of his diligence outside of it. He spends one hour studying before school, and two hours after, every day. He spends two hours a day walking to and from school, and he recently had to move from his grandmother’s to his mother’s house in order to put in time helping with daily chores. Still, Jean excels in English, Spanish, Creole and History. His studious work has earned him a 2018 Help for Haiti Academic Achievement Award, as well as a $20 USD scholarship to pay for the 2018-2019 school tuition. 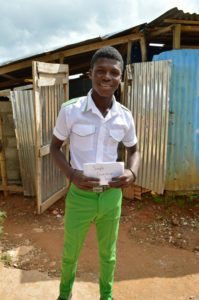 Jean loves English, but is holding onto his dream of becoming an engineer. When he graduates from high school, Jean will need to relocate to one of Haiti’s major cities – Cap Haïtien or Port-au-Prince – to enroll in university and earn his degree. As part of our mission to help kids become educated and employable adults, we are preparing for the possibility of sustaining Jean’s financial needs through his university education. We ask that you consider supporting us in our efforts to feed and educate Jean, and other children, as they grow to become employable adults.